Existing students: Log in here to the TimelyBooking schedule. You’ll be sent an email reminder before your lesson. Please make sure you’re on Skype before the lesson starts. New students: Please register on my site and then I’ll contact you to arrange your free trial lesson. Note: Prices are in New Zealand dollars (NZD). Lessons last 55 minutes. (25 minute lessons also available). (*approximate – Click here for currency converter to see the cost in your local currency). Want to save money and improve your English faster? 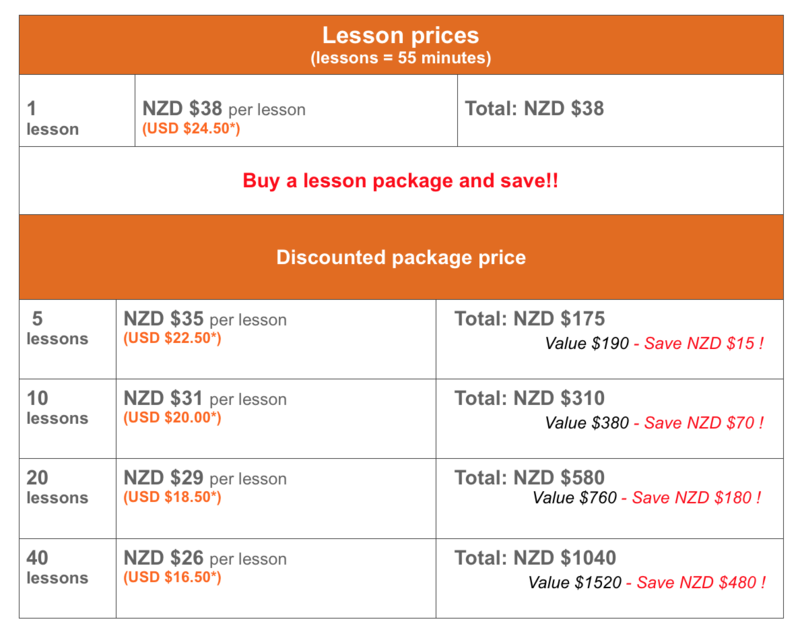 Buy more lessons at one time! The more you buy, the more you save! Click here for terms and conditions. Credits are valid for 1 year from the date of purchase.